The past two weeks have been a whirlwind. We drove with our three sons from Washington DC to Port Canaveral, Florida to take a 7 day cruise in the Caribbean. 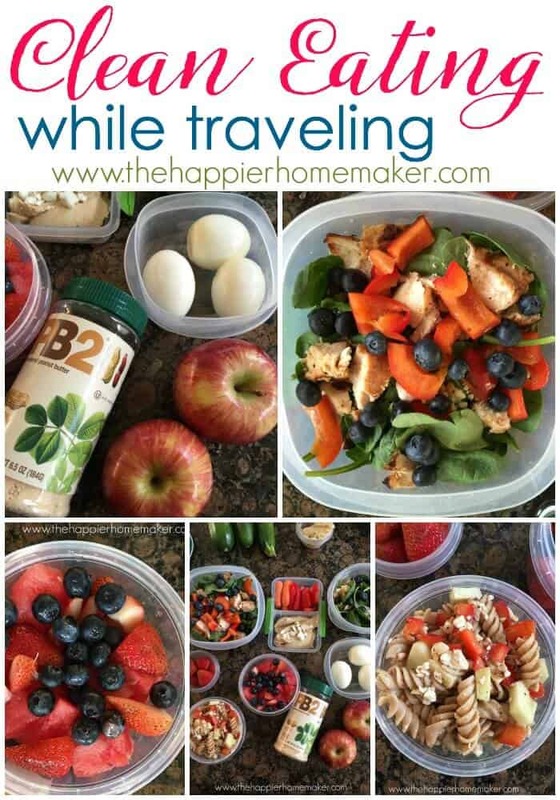 I received so many sweet comments and emails wishing us a fun trip and asking how I was going to handle my new found clean eating habits on the road that I thought I’d give you a little recap today and share with you my advice for how to eat clean while traveling. 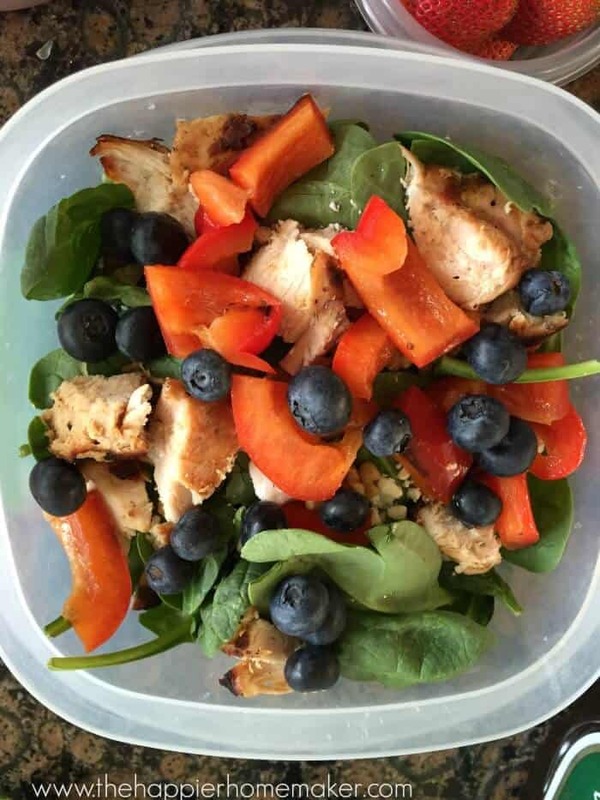 Salads for each day’s lunch with spinach, blueberries, feta, red peppers and some chicken breast I had grilled the night before. I used balsalmic vinegar for my dressing and carried it in a separate container so the salads didn’t get soggy before I ate them. 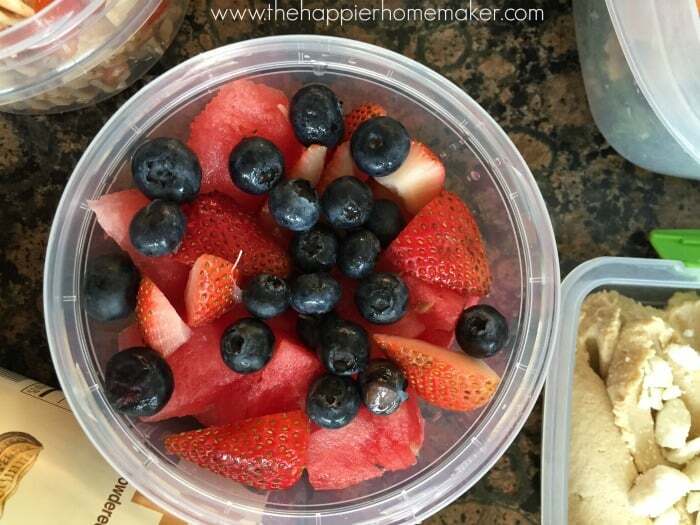 My favorite watermelon berry fruit salad was packed up for both myself and my boys to snack on-I shared the recipe recently, it’s perfect for this time of year! 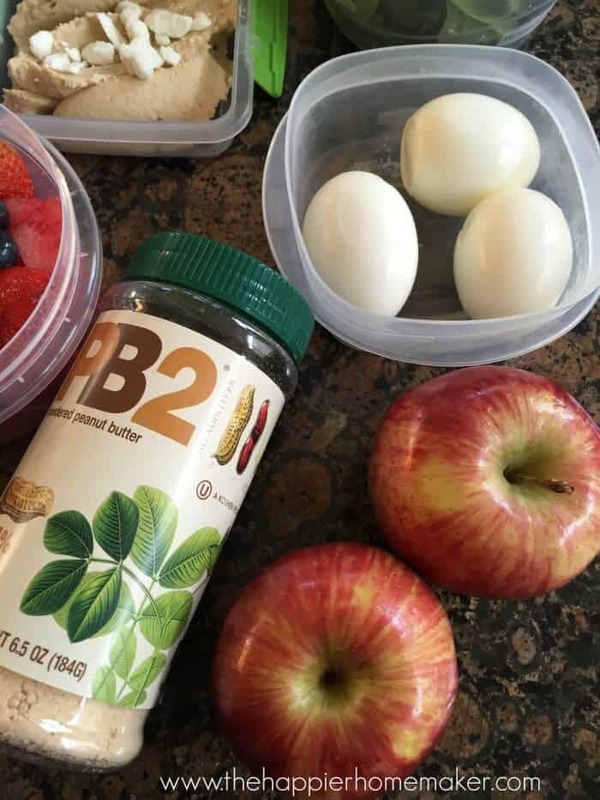 Snacks included hard boiled eggs, hummus and veggies, and apples (I brought my PB2 and a small container to mix it in because you know I can’t live without it!) I knew my husband was going to eat fast food but I still tried to pack some healthier snacks for him as well-all natural jerky, dried apricots, and the eggs were his favorites! 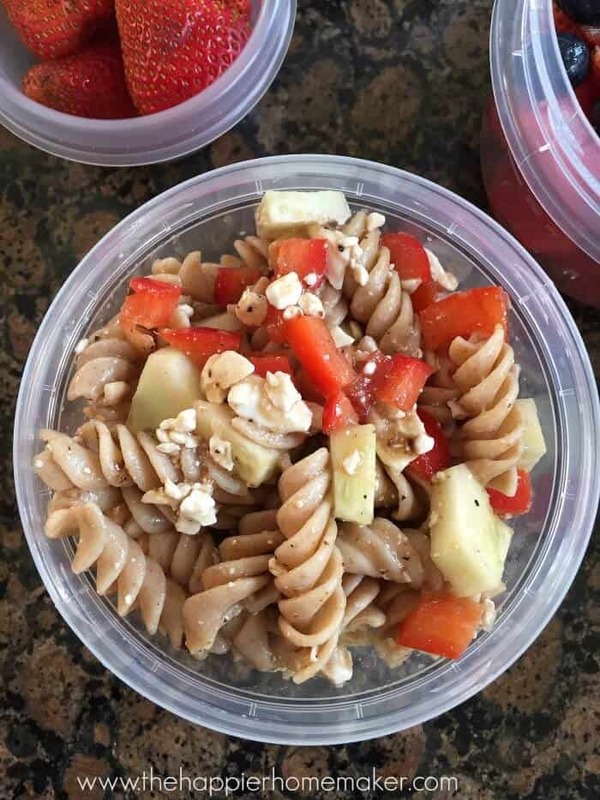 I also whipped up a pasta salad snack with whole grain rotini, cucumber, zucchini, peppers, feta and balsalmic vinegarette to get in some whole grains. I packed half a loaf of my new favorite bread too-Rudi’s 14 Grain (it has an amazing nutty flavor!) I spread the bread with PB2 and sliced bananas for breakfast! All of the food traveled well in my cooler and I had more than enough to eat on the trip-it was a major success! Before we got on the cruise Saturday morning I washed out all of the containers so they would be clean for the ride back and stuck my PB2 in my suitcase because I wasn’t going all week without that! Breakfasts were easy as well-eggs, fruit, and oatmeal were all available on the lido deck buffet and along the lines of what I normally eat. Dinners got dicey-my husband and I put our boys in the kid’s camp most evenings for dinner so we could eat alone (a luxury with three kids under 9!) and I didn’t always know what each dish would have in it. I tried to choose salads and entrees like fresh fish and ask for sauces on the side-they did a good job of labeling their dishes that were healthier options. So reality check time-how did I do overall? In all honesty I totally fell off the wagon for the second half of the cruise. I ate chocolate melting cake at dinner on quite a few nights (I previously shared my own recipe for it after a previous cruise-soooo good!) I ate mostly healthy for my main meals but there were definitely a few hamburgers in there too! I’m back on track now that we’re home and I enjoyed my trip. My belly definitely let me know it didn’t love that food and I’m sure I gained a pound or two (I refuse to step on a scale for a few weeks!) but I have no problem with my “cheat” meals. As I mentioned the first time I told you all about starting this clean eating lifestyle-I’m not aiming for perfection…that will only set me up for failure. I aim to eat clean at least 80% of the time and the longer I do it, the less appealing those other foods become! On the drive home I had a harder time eating as well as I did on the way down to Florida-I tried to stop at a grocery store instead of fast food to stock up on fresh fruit, salad, but it was definitely a struggle to find the same level of healthy foods I was able to provide when packing from home. For the cruise itself, we had a great, but exhausting time! 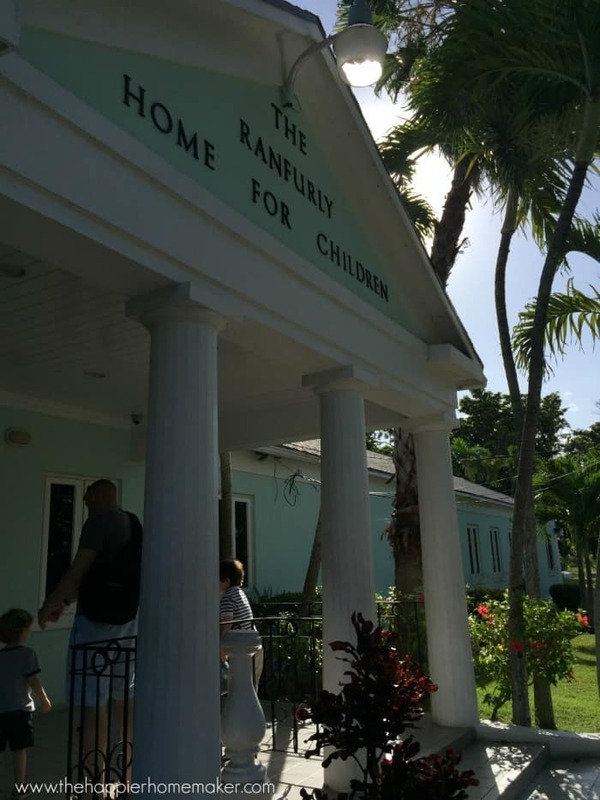 Our first stop was in Nassau, Bahamas where we took our boys to the Ranfurly Children’s Home to donate some items they collected for the children. We got a little bit scammed by our taxi driver (always discuss TOTAL price beforehand-lesson learned!) but we didn’t let it sour our visit. 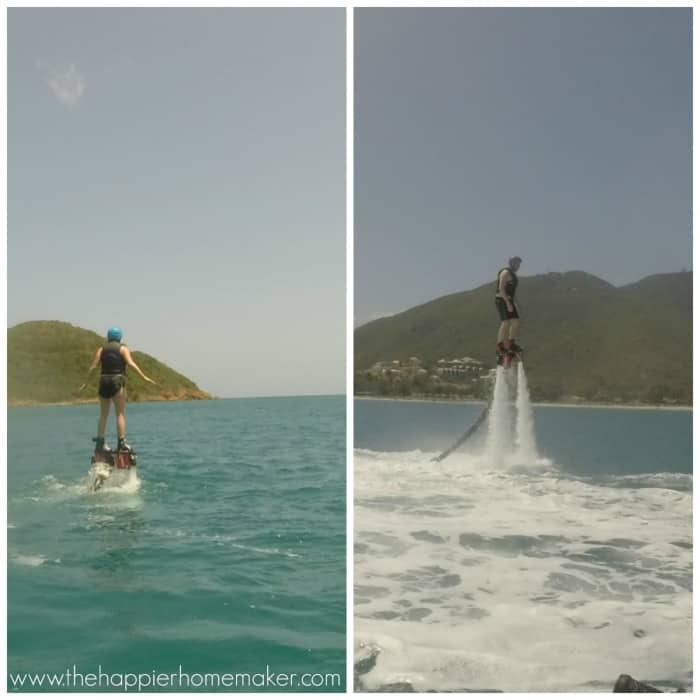 The next stop was St. Thomas where my husband and I tried Flyboarding-have you heard of it? They strap boots to your feet with waterjets coming out of the bottom and you can levitate up in the air like Ironman! It was a lot more of a workout than I thought it would be but I managed to get about 5-6 feet up in the air despite having sprained my ankle the day before. 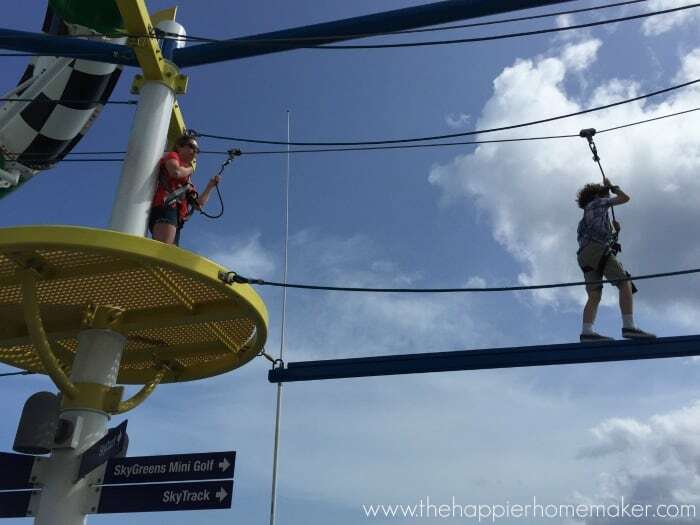 My husband blew it out of the water (literally) though-he was up to 20+ feet in the air within a half hour of trying it. It was a blast! Our next stop was San Juan, Puerto Rico-the only port we hadn’t visited before. Y’all, I fell in love with Old San Juan! I’m already planning a return visit as soon as I can! The history was amazing and it reminded me so much of the old cities my husband and I would visit when we lived in Italy years ago! Last stop was Grank Turk in the Turks and Caicos. We had been there before and knew that the shipped docked close to the beach so we decided to take it easy and simply walk off the ship to the beach with the boys-they swam, snorkeled, and built sandcastles-it was a blast! The water is gorgeous! My husband, who is a paratrooper and has been jumping out of airplanes for almost 20 years now, thought this was hilarious. There may or may not have been some choice words directed at him from me as he watched me smiling while I was about to freak out! Traveling for almost two weeks with three kids under 9 was challenging at times and it feels great to be back home! 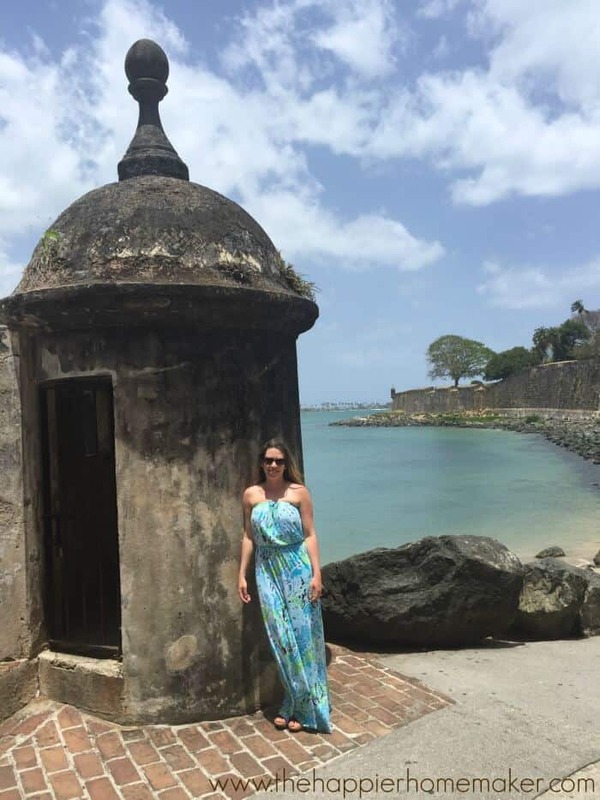 I’m hoping to plan a return trip to Puerto Rico this autumn when my husband and I celebrate our tenth anniversary-I definitely need much more than a day to explore that beautiful island! 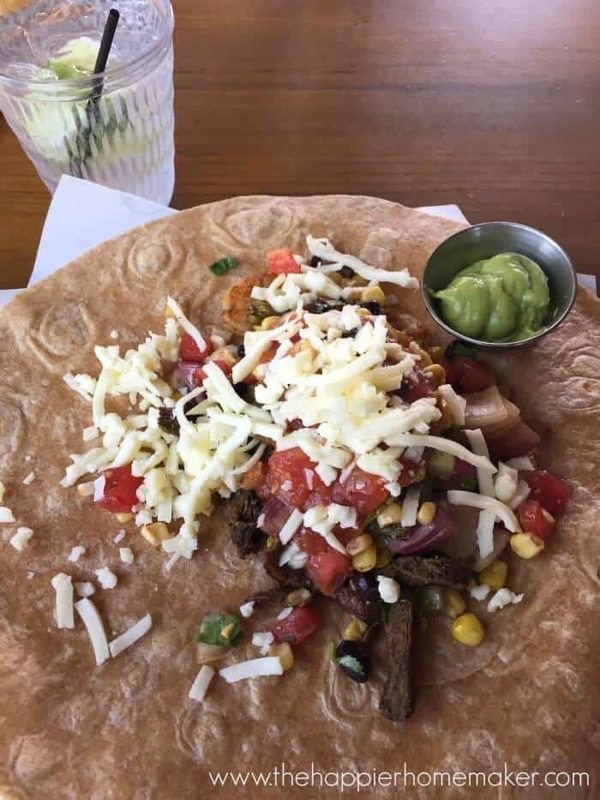 How do you try to eat healthy on vacation? (Or do you try at all??) I’d love to hear your thoughts on it! « How Often Should You Be Cleaning? previous post: How Often Should You Be Cleaning? 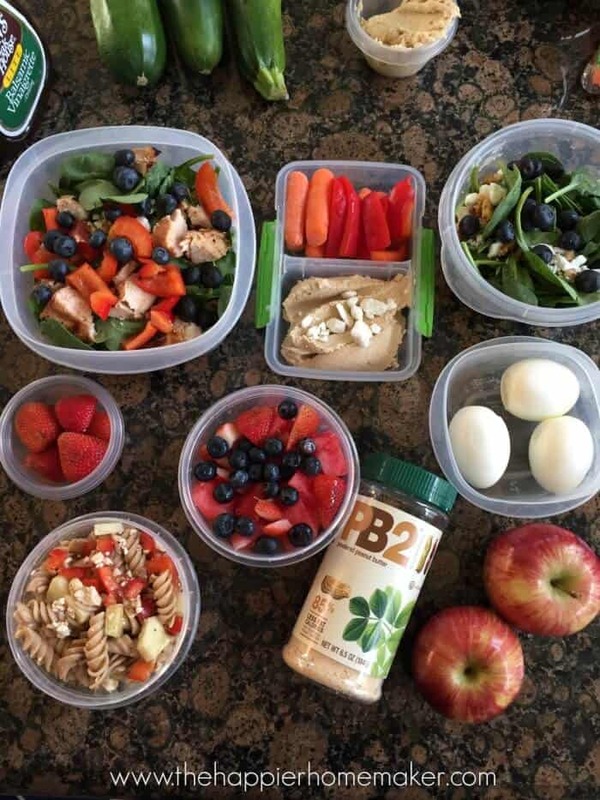 I think you nailed it by pre-cutting and putting together the salads. Simply packing everything in the cooler doesn’t seem to work well for us and makes the drive thru more appealing. I’ll remember this post the next time we hit the road. Thanks! I enjoyed hearing all about your cruise and seeing the pictures. 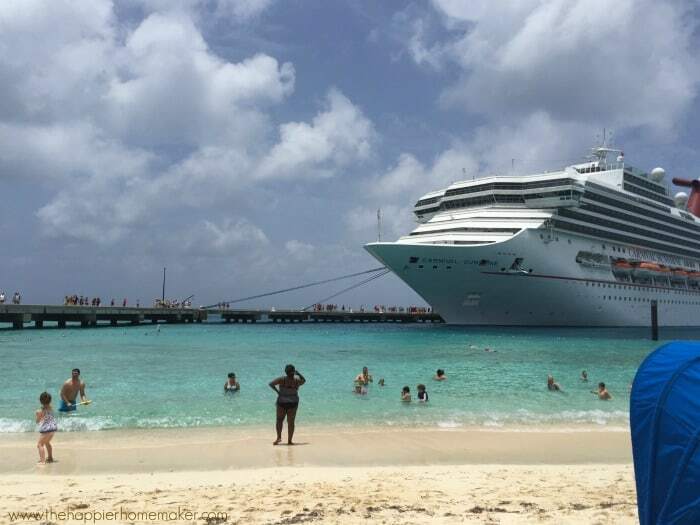 As far as falling off your eating plan the second half of the cruise, it’s all good as long as you get back to eating healthy again afterwards. Thanks for sharing with us. Flyboarding looks so cool! I’d love to be able to try that one day. Great job on eating clean while on the cruise. I wouldn’t even have been able to control myself as much as you did. Thanks Marj-it was definitely hard to come back totally clean after the cheats I allowed myself…I think I’d scale back on the sweets next time, it seems like the more often I have sugars like that the more I crave them! Hi Melissa, I love traveling through cruise, and the very best thing is you get to choose what to eat on board. Yes, I love to eat salads mostly vegies, but I also love your idea of mixing fruits and vegies with cream and milk.